When you have a safety deposit box, you should consider what you will use it for before determining which size is appropriate for your needs. Your bank will provide you with a key to your box. You will have to show identification in order to access it. Important things to include in your safety deposit box are deeds and titles to any properties you own. You may also choose to keep birth certificates, death certificates, social security cards and wills in the box. All of these documents are time consuming to replace and are needed infrequently. If you have precious jewels that you only wear on special occasions, you may choose to keep it in your box as well. If you have historical documents or family heirlooms, they will be safer in a box at the bank than your own home. Many people choose to keep their family tree in the box so it is preserved for future generations. Valuable art work can also be stored in a safety deposit box. If you have fine art, it can make your home a target for thieves. Collections are another potential thing to include in your box. Coin collections and stamp collections do not take much space but, depending on the content, can have significant value. So can baseball cards or memorabilia from movies or other collectibles, such as dolls and other items that are still in mint condition. 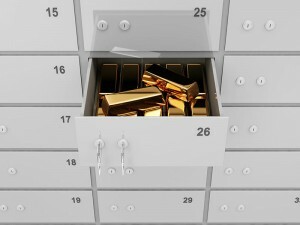 Having a safety deposit box will help you to sleep more soundly at night. You will know that your precious and important items are safe from theft. Your home will be less of a target if you do not keep expensive items there. Additionally, you will find it easier to access your important documents should some disaster fall upon you or your family. Once you know what you will put in it, go to your bank and discuss the matter.